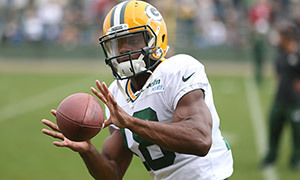 GREEN BAY — Randall Cobb’s status for Sunday’s season opener in Chicago is the burning issue as the Packers begin preparations to face the Bears. “My expectation for Randall is to prepare and get ready for Chicago. I’m hopeful everybody practices today,” Packers Head Coach Mike McCarthy said on Wednesday. Cobb is trying to recover from a shoulder injury he sustained in the third game of the preseason. The Packers will provide a practice participation report following Wednesday’s practice. John Fox is the Bears’ new coach. What do the Packers expect from the Fox-coached Bears? “The belief in running the football and stopping the run. He’s done an excellent job in protecting the football and taking the football away,” McCarthy said. “I feel good where we are. These are the most difficult games to win, early in the season, because of the unknowns. We have young players playing in this rivalry for the first time,” McCarthy added about his own team. “We’re getting ready for him and his new offense,” McCarthy said.